In 2001 the AEIF were granted a mandate to revise the first set of high speed TSIs which had been adopted in 2002, related to the rolling stock, infrastructure, control-command and signalling, energy, maintenance, and operation sub-systems. As part of this part the AEIF were asked to consider, amongst other issues, the harmonisation of the TSIs with those on conventional rail interoperability and the accessibility for mobility-impaired persons. For this reason the draft TSI on persons with reduced mobility prepared by the AEIF covered both conventional and high speed rail. The first high speed TSI of the rolling stock sub-system, adopted as Annex to Decision 2002/735/EC, came into force in 2002. Due to existing contractual commitments, new rolling stock sub-systems or interoperability constituents, or their renewal and upgrade may today fall under conformity assessment against this first TSI. As this TSI in Annex to this Decision is applicable to all new, renewed and upgraded high speed and conventional rail rolling stock, it is important to determine the scope of applicability of the first high speed rolling stock TSI which was adopted as Annex to Decision 2002/735/EC. Member States shall notify an exhaustive list of subsystems and interoperability constituents which are at an advanced stage of development, and fall under Article 7(a) of Directive 96/48/EC. These shall be notified to the Commission not later than six months after the date on which the present Decision becomes applicable. The draft TSI has been examined by the Committee set up by Concil Directive 96/48/EC of 23 July 1996 on the interoperability of the trans-European high-speed rail system (3) and referred to in Article 21 of Directive 2001/16/EC. The main stakeholders have been consulted during the elaboration of the draft TSI. Their observations and concerns have been taken into account wherever possible. The main objective of the underlying Directives 2001/16/EC and 96/48/EC is interoperability. The aim of the TSI is to harmonise the provisions to be made for persons with reduced mobility travelling as passengers on the conventional and high-speed railway system. Train, stations and relevant parts of the infrastructure that comply with the measures described within the TSI will permit interoperability and offer a similar level of access to persons with reduced mobility across the trans-European network. The TSI does not prevent Member States from introducing additional measures for improving access, as long as it does not impede interoperability or place undue cost on Railway Undertakings. Improved accessibility to rolling stock and stations for disabled and persons with reduced mobility could potentially increase the number of passengers that are currently are forced to use other modes of transport. Directives 2001/16/EC and 96/48/EC and the TSIs do apply to renewals but not to maintenance-related replacements. However Member States are encouraged, when they are able to do so and where it is justified by the scope of the maintenance-related work, to apply the TSIs to maintenance-related replacements. In its current version the TSI does not fully deal with all essential requirements. In accordance with Article 17 of Directive 2001/16/EC, and Article 17 of Directive 96/48/EC, both as modified by Directive 2004/50/EC, technical aspects which are not covered are identified as ‘Open Points’ in Annex L of this TSI. In accordance with Article 17 of Directive 2001/16/EC and Article 17 of Directive 96/48/EC, both as modified by Directive 2004/50/EC, individual Member States are to inform the other Member States and the Commission of the relevant national technical rules in use for implementing essential requirements related to these ‘open points’, as well as of the bodies it appoints for carrying out the procedure for the assessment of conformity or suitability for use as well as the checking procedure in use for verifying the interoperability of subsystems within the meaning of Article 16(2) of Directive 2001/16/EC and Article 16(2) of 96/48/EC. For this latter purpose, Member States should apply, as far as possible, the principles and criteria provided for in Directives 2001/16/EC and 96/48/EC. Wherever possible Member States shall make use of the bodies notified under Article 20 of Directive 2001/16/EC and Article 20 of 96/48/EC. The Commission should carry out an analysis of the information forwarded by the Member States, in the form of national rules, procedures, bodies in charge of implementing procedures, and duration of these procedures, and, where appropriate, should discuss with the Committee the need for the adoption of any measures. The TSI in question should not demand the use of specific technologies or technical solutions except where this is strictly necessary for the interoperability of the trans-European conventional rail system. To encourage innovation and in order to take into account the experience acquired, the attached TSI should be subject to a periodical revision at regular intervals. Where innovative solutions are proposed the manufacturer or the contracting entity shall state the deviation from the relevant section of the TSI. The European Rail Agency will finalise the appropriate functional and interface specifications of the solution and develop the assessment methods. A Technical Specification for Interoperability (‘TSI’) relating to ‘persons with reduced mobility’ is hereby adopted by the Commission in accordance with Article 6(1) of the Directive 2001/16/EC and Article 6(1) of Directive 96/48/EC. The TSI shall be fully applicable to the trans-European conventional rail system as defined in Article 2 and Annex I to Directive 2001/16/EC, and the trans-European high-speed rail system as defined in Article 2 and Annex I to Directive 96/48/EC. Member States may still apply Commission Decision 2002/735/EC for those projects falling under the scope of Article 7(a) of Directive 96/48/EC. An exhaustive list of the sub-systems and interoperability constituents to which this is applicable shall be notified to the Commission not later than six months after the date on which this Decision becomes applicable. 1. With regard to those issues classified as ‘Open points’ set out in Annex C of the TSI, the conditions to be complied with for the verification of the interoperability pursuant to Article 16(2) of Directive 2001/16/EC and Article 16(2) of Directive 96/48/EC shall be those applicable technical rules in use in the Member State which authorise the placing in service of the subsystems covered by this Decision. the bodies it appoints for carrying out those conformity-assessment and checking procedures. This Decision shall apply from 1 July 2008. Done at Brussels, 21 December 2007. (1) OJ L 110, 20.4.2001, p. 1. (2) OJ L 235, 17.9.1996, p. 6. (3) OJ L 235, 17.9.1996. Directive as last amended by Commission Directive 2007/32/EC (OJ L 141, 2.6.2007, p. 63). (4) Regulation of the European Parliament and of the Council on International Rail Passengers' Rights and Obligations, COM(2004)143 final of 3 March 2004. Definitions of terms used in this TSI. Application of this TSI to new Infrastructure/Rolling Stock. This TSI covers the Conventional and High Speed Rail Infrastructure and passenger Rolling Stock subsystems as described in Annex I to Directive 2001/16/EC modified by Directive 2004/50/EC, only for the Aspect ‘Accessibility for Persons with Reduced Mobility’. It also deals with some elements of the ‘Telematics Applications for Passengers’ subsystem, such as, for example, ticketing equipment. the needs for evacuation in the case of hazardous situations. This TSI does not specify operating rules for evacuation, but only technical and professional qualification requirements. Purpose of technical requirements is to facilitate evacuation for all. Some operating rules not related to evacuation can be found in clauses 4.1.4 and 4.2.4 of this TSI. the Conventional Rail Rolling Stock subsystem shown in the list in point 1 of Annex II to Directive 2001/16/EC, as modified by Directive 2004/50/EC, only when intended to carry passengers. However, heritage Rolling Stock is specifically excluded from the need to comply at upgrade or renewal. the High Speed Rail Rolling Stock subsystem shown in the list in point 1 of Annex II of Directive 96/48/EC, as modified by Directive 2004/50/EC. To a minor extent, the High-Speed and Conventional Rail ‘Telematics Applications for Passengers’ subsystems as identified in Annex II to Directive 96/48/EC as modified by Directive 2004/50/EC, and in Annex II to Directive 2001/16/EC. Further information on the subsystems is provided in Chapter 2. The geographical scope of this TSI is the trans-European conventional rail system as described in Annex I to Directive 2001/16/modified by Directive 2004/50/EC, and the trans-European high-speed rail system described in Annex I to Directive 96/48/EC as modified by Directive 2004/50/EC. Reference is made, in particular, to the lines of the conventional and high speed rail network referred to in Decision No 1692/96/EC of the European Parliament and of the Council of 23 July 1996 on Community guidelines for the development of the trans-European transport network, or those included in any update of this Decision resulting from the revision provided for in Article 21 of the Decision, especially Decision No 884/2004/CE of the European Parliament and of the Council of 29 April 2004.
establishes the functional and technical specifications to be met by the subsystem and its interfaces with other subsystems (section 4). indicates, for the staff concerned, the professional qualifications and health and safety conditions at work required for the operation and maintenance of the subsystems, as well as the implementation of the TSI — (section 4). Moreover, in accordance with Article 5(5), provision may be made for specific cases for each TSI; these are indicated in Section 7. Lastly, this TSI also comprises, in Section 4, the operating and maintenance rules specific to the scope indicated in clauses 1.1 and 1.2 above. The track, points, engineering structures (footbridges, tunnels, etc. ), associated station Infrastructure (platforms, zones of access, including the needs of persons with reduced mobility, etc. ), safety and protective equipment. This includes the accessibility of the public areas of the Infrastructure (including stations) controlled by the Railway Undertaking, Infrastructure Manager or Station Manager. This TSI is only applicable to the public areas of the stations and their zones of access controlled by the Railway Undertaking, Infrastructure Manager or Station Manager. Structure, command and control system for all train equipment, traction and energy conversion units, braking, coupling and running gear (bogies, axles, etc.) and suspension, doors, man/machine interfaces (driver, on-board staff and passengers, including the needs of persons with reduced mobility), passive or active safety devices and requisites for the health of passengers and on-board staff. Applications for passenger services, including systems providing passengers with information before and during the journey, reservation and payment systems, luggage management and management of connections between trains and with other modes of transport. Communication impaired (meaning persons who have difficulty in communicating or understanding the written, or spoken language, and including foreign people with lack of knowledge of the local language, people with communication difficulties, people with sensory, psychological and intellectual impairments). People of small stature (including children). Impairments may be long-term or temporary, and may be visible or hidden. However, PRM does not include people that are alcohol or drug dependent, unless such dependency has been caused by medical treatment. The transport of oversized items (for example: bicycles and bulky luggage) is not within the scope of this TSI. These are subject to the rules, safety requirements and commercial decisions, of the Infrastructure Manager, Station Manager or Railway Undertaking in terms of permitted size, weight and security arrangements. and verification of the subsystem. specific cases described in clause 7.3 of the present TSI. The corresponding conformity assessment shall be carried out according to procedures that are defined by a Member State that has notified the National Rules or asked for the derogation or the specific case. Under to Article 4(1) of Directive 2001/16/EC modified by Directive 2004/50/EC, the Trans-European high-speed rail system, subsystems and their interoperability constituents shall meet the essential requirements set out in general terms in Annex III of the Directive. Conformity of the Infrastructure and Rolling Stock subsystems and their constituents to the essential requirements are checked in accordance with the provisions envisaged in Directive 2001/16/EC modified by Directive 2004/50/EC as well as in this TSI. Essential requirements listed below are according to Annex III to Directive 2001/16/EC modified by Directive 2004/50/EC, which is the last published. This essential requirement is not relevant within in the scope of this TSI. This essential requirement is not relevant within the scope of this TSI. The trans-European conventional rail system, to which Directive 2001/16/EC modified by Directive 2004/50/EC applies and of which the subsystem is a part, is an integrated system whose consistency shall be verified. This consistency shall be checked in particular with regard to the specifications of each subsystem, its interfaces vis-à-vis the system in which it is integrated as well as the operating and maintenance rules. The functional and technical specifications of the subsystem and its interfaces, described in section 4.1.2, do not impose the use of specific technologies or technical solutions, except where this is strictly necessary for the interoperability of the trans-European conventional rail network. But innovative solutions for interoperability may require new specifications and/or new assessment methods. In order to allow technological innovation, these specifications and assessment methods shall be developed by the process described in sections 6.1.4 and 6.2.4. For each basic parameter a general clause introduces the subject. The following clauses then detail the conditions to be met in order to fulfil the requirements introduced in the general clause. Where a station specific parking area exists, there shall be parking spaces reserved for PRM eligible to utilise disabled parking spaces at the nearest practicable position, within the parking area, to an accessible entrance. There are no other Railway specific requirements as European or National Rules shall apply to parking spaces (this includes, but is not limited to: — the number of spaces, access, location, dimensions, materials, colours, signing and lighting). An obstacle free route is a route that can be freely navigated by all categories of PRM. It may include ramps or lifts where these are constructed and operated in accordance with Clause 4.1.2.17. 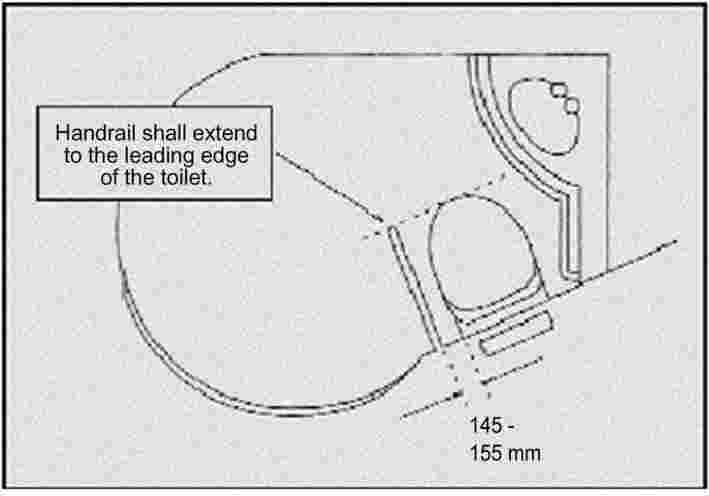 All obstacle-free routes, stairs, footbridges and subways, shall have a free width of a minimum of 1 600 mm, with a minimum headroom of 2 300 mm over the entire width of 1 600 mm. The minimum width requirement does not take into account additional width that may be required for passenger flows. This requirement is not applicable to escalators, travelators and lifts. Obstacle-free routes floor surfaces shall have anti-reflecting properties. New stations with a throughput of less than 1 000 passengers per day (combined total of passengers embarking and disembarking) are not required to have lifts or ramps where these would otherwise be necessary to achieve full compliance with this clause if another station within 30 km on the same route provides a fully compliant obstacle-free route. In such circumstances the design of new stations shall incorporate provision for the future installation of a lift and/or ramps to make the station accessible to all categories of PRM. Obstacle-free routes shall be clearly identified by visual information as detailed in clause 4.1.2.11. Information on the obstacle-free route shall be given to visually impaired people by a minimum of one of the following means: e.g. tactile paths, audible, tactile signs, talking signs, Braille maps. If a tactile path is installed it shall comply with National Rules and shall be provided along the full length of the obstacle-free route(s). If there are handrails or walls within reach along the obstacle-free route to the platform, they shall have brief information (for example platform-number or direction-information) in Braille and in prismatic-letters or numbers at the rear of the handrail, or on the wall at a height between 850 mm and 1 000 mm. Numbers and arrows are the only permissible tactile pictograms. This clause applies to all doors and entrances that are on obstacle-free routes. A minimum of one accessible entrance to the station, and one accessible entrance to the platforms shall be provided. Doors and entrances shall have a minimum clear opening width of 800 mm, free headroom of 2 100 mm. It is permitted to use either manual, semi-automatic or automatic doors. Door operating devices shall be available at a height of between 800 mm and 1 200 mm. Manual, non-sliding doors shall be provided with horizontal push bars, extending across the full width of the door, on both sides of the door. Automatic and semi-automatic doors shall incorporate devices that prevent passengers becoming trapped during operation of the doors. If pushbuttons or other remote control devices are provided for operation of doors then each pushbutton or device shall contrast with its surroundings and shall be operable by a force not greater than 15 Newtons. If both open and closed pushbuttons are fitted one above the other, the top button shall always be the open control. The centre of the control shall be not less than 800 mm and not more than 1 200 mm vertically above floor level. Such controls shall be identifiable by touch (for example tactile markings) and shall indicate the functionality. The force required to open or close a manual door, under wind-free conditions, shall not exceed 25 Newtons. To latch or unlatch a manual door the handle shall be operable by the palm of the hand exerting a force not exceeding 20 Newtons. Where a revolving door is used, an additional non-revolving door shall be provided, that is freely available for use, adjacent to the revolving door. At doors and entrances thresholds shall not be higher than 25 mm. Where thresholds are installed, they shall contrast in colour with the immediate background. All floor surfaces shall be slip resistant in accordance with National Rules for public buildings. Within the station buildings there shall be no irregularities in excess of 5 mm at any given point in floor walking surface areas, except for tactile guiding paths, drainage channels and tactile warning indicators. Transparent obstacles on or along the main routes used by passengers, consisting of glass doors or transparent walls, shall be marked with at least two prominent bands made of signs, logos, emblems or decorative features at a height between 1 500 mm and 2 000 mm for one line, and between 850 mm and 1 050 mm for the other line. These markings shall contrast with the background against which they are viewed. These markings shall be a minimum of 100 mm high. These markings are not required along transparent walls if passengers are protected from impact by other means — for example, by handrails or continuous benches. If toilets are provided at a station, baby-changing facilities shall be provided which are accessible to both men and women. They shall comply with requirements of clause 4.1.2.7.2. In order to allow passengers with bulky luggage to use the toilets, the minimum dimensions of all toilet cubicles shall be 900 mm wide and 1 700 mm length if the door opens inwards, and 1 500 mm length if the door open outwards or is a sliding door. The door and all entrances to the toilet facilities shall have a minimum clear width of 650 mm. European and National Rules shall apply regarding the dimensions and equipment of toilets for wheelchair users. In the useable position, the changing facility shall be between 800 mm and 1 000 mm above floor level. It shall be a minimum of 500 mm wide and 700 mm long. It shall be designed to prevent a baby from inadvertently sliding off, shall have no sharp edges and shall be able to take a minimum weight of 80 kg. If the baby-change table protrudes into the accessible toilet space, it shall be possible to put it into the stowed position using a force not exceeding 25 Newtons. Within the station confines, furniture and free-standing devices shall be positioned where they do not obstruct blind or visually impaired people, and they shall be detectable by a blind person using a stick. 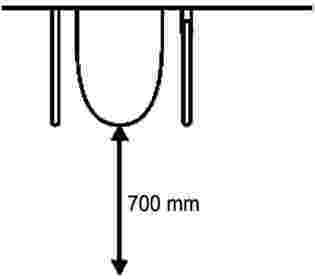 Cantilevered items fitted below a height of 2 100 mm, which protrude by more than 150 mm, shall be indicated by an obstacle, at a maximum height of 300 mm, that can be detected by a blind person using a stick. There shall be no hanging elements below a height of 2 100 mm. On each platform where passengers are allowed to wait for trains, and at every resting area, there shall be a minimum of one weather-protected area fitted with ergonomic seating facilities. The seats shall be back supported and at least one third provided with armrests. There shall also be a standing rest bar of at least 1 400 mm length and a space for a wheelchair. Where manual ticket sales counters, information desks and customer assistance points are provided along the obstacle-free route, a minimum of one desk shall be a minimum of 650 mm to the underside of the desk, have a knee well of a minimum of 300 mm deep and have a minimum width of 600 mm. The height of the upper surface, or a part of it with a minimum width of 300 mm and a minimum depth of 200 mm, shall be between 700 mm and 800 mm. This area shall be made available for wheelchair users and alternative seating arrangements shall be provided for other PRM. A minimum of one ticket sales position shall be fitted with the necessary equipment in order to enable a PRM with hearing impairment to understand what is being said by switching their hearing assistance device to the ‘T’ position. Where ticket vending machines are provided on an obstacle free route at a station, a minimum of one of these machines shall comply with requirements of clause 4.1.2.9.2. If ticket control machines are fitted, a minimum of one of the machines shall have a free passageway with a minimum width of 800 mm and shall be able to accommodate a wheelchair up to 1 200 mm in length. If turnstiles are used, there shall be a non-turnstile access point available for use by PRM at all operational times. The ticket vending machines to be provided on an obstacle free route at a station according to clause 4.1.2.9.1 shall have the tactile contact area (to include the keyboard, the payment and ticket vending areas) at a height of between 700 mm and 1 200 mm. A minimum of one display and the keyboard shall be visible by both someone sitting in a wheelchair and by someone standing in front of the machine. If the display is the method of entering information then it shall comply with the requirements of this paragraph. The station forecourt lighting shall be in accordance with European or National Rules. From the accessible building entrance to the platform access point, the obstacle-free route shall be illuminated to a minimum of 100 lux, measured at floor level, within the confines of the station building. The minimum required light level on the main entrance, stairs, and at the end of ramps, shall be a minimum of 100 lux measured at floor level. If artificial lighting is required to achieve this, the required lighting level shall be a minimum of 40 lux above the ambient surrounding light levels, and have a colder colour temperature. Platforms and other external station passenger areas shall have a minimum average illumination level of 20 lux measured at floor level, with a minimum value of 10 lux. Where artificial lighting is required to allow detailed information to be read, these locations shall be highlighted by lighting with a minimum 15 lux increase over that provided in adjacent areas. Such increased lighting shall also have a different colour temperature to that in the adjacent areas. Emergency lighting shall be in accordance with European or National Rules. Within a station all information shall be of a consistent nature and in accordance with European or National Rules. Sans Serif fonts, in mixed case, shall be used for all written information. (i.e. not in capital letters only). Compressed descenders and ascenders shall not be used. Descenders shall be clearly recognisable and have a minimum size ratio of 20 % to the upper case characters. Visual information shall be legible in all lighting conditions when the station is operational. Where dynamic visual information is provided, it shall be consistent with essential spoken information that is being given. Safety Information and Safety Instructions in accordance with European or National Rules. Warning, prohibition and mandatory actions signs in accordance with European or National Rules. Information concerning the departure of train services. Information shall be provided at all points where passengers need to make a route taking decision and at intervals on the route at a maximum 100 m intervals. Signage, symbols and pictograms shall be applied consistently over the whole route. Lifts in accordance with EN 81-70:2003 Appendix E.4. Advertisements shall not be combined with the routeing and information systems. Note: General information about public transport services shall not be considered as advertisements for the purposes of this Clause. The symbols are permitted to be combined with other symbols (for example: lift, toilet, etc). Where inductive loops are fitted these shall be indicated by a sign as described Annex N Clauses N.2 and N.5. Where the facility is provided, a graphic symbol shall indicate a storage place for heavy luggage and bulky goods. If there is a call for assistance or call for information facility, these shall be indicated by a sign as described in Annex N Clauses N.2 and N.6. it shall be indicated by a sign as described in clause Annex N Clauses N.2 and N.7. In universal toilets and in wheelchair accessible toilets, where hinged handrails are provided, a graphic symbol showing the rail in both the upright and lowered position shall be provided. Displays shall be sized to show complete individual station names or words of messages. Each station name, or words of messages, shall be displayed for a minimum of 2 seconds. If a scrolling display is used (either horizontal or vertical), each complete word shall be displayed for a minimum of 2 seconds and the horizontal scrolling speed shall not exceed 6 characters per second. The minimum height of letters shall be calculated according to the following formula: Reading distance in mm divided by 250 = font size (for example: 10 000 mm/250 = 40 mm). Maximum reading distance is a characteristic of the interoperability constituent. The spoken information shall have a minimum RASTI level of 0,5, in accordance with IEC 60268-16 part 16, in all areas. Where provided, spoken information shall be consistent with essential visual information that is being displayed. Where spoken information is not provided automatically, an audible communication system shall be provided to allow users to get information upon request. Emergency exits and alarms shall be in accordance with European or National Rules. If footbridges or subways are used as part of the normal passenger walking route within the confines of the station, these shall have an obstacle-free area of a minimum of 1 600 mm wide and a minimum headroom of 2 300 mm throughout. The minimum width requirement does not take into account additional width that may be required for high passenger flows, these additional widths shall be in accordance with National Rules. Staircases shall comply with European or National Rules. Staircases on the main route shall have a minimum obstacle-free width of 1 600 mm measured between the handrails. The minimum width requirement does not take into account additional width that may be required for passenger flows. All stair tread surfaces shall have anti-slip properties. Prior to the first ascending stair and also prior to the first descending stair there shall be a tactile band, over the whole width of the stair. This band shall have a minimum depth of 400 mm, shall contrast with and be integrated into the floor surface. This band shall differ to those used for the tactile guide path where installed. Open areas beneath stairs shall be protected to prevent passengers from inadvertent collision with structural supports and areas of reduced headroom. Stairs and ramps shall be provided with handrails on both sides and at two levels. The higher handrail shall be positioned at between 850 mm and 1 000 mm above floor level, the lower handrail shall be positioned at a height of between 500 mm and 750 mm above floor level. There shall be a minimum clear space of 40 mm between the handrail and other parts of the structure other than its mountings. Handrails shall be continuous. When fitted on stairs they shall extend for a minimum of 300 mm beyond the top and bottom steps (these extensions may be curved away in order to prevent obstructions). The handrail shall be rounded and have a cross section of 30 mm to 50 mm equivalent diameter. Handrails shall contrast with the surrounding wall colours. Ramps shall be installed for PRM unable to use stairs where lifts are not provided. Ramps shall be in accordance with European or National Rules. Where fitted, escalators shall have a maximum speed of 0,65 m/s and shall be designed in accordance with European or National Rules. Lifts shall be provided where ramps are not available and shall be designed in accordance with EN 81-70:2003, clause 5.3.2.1 table 1. Where fitted, travelators shall have a maximum speed of 0,75 m/s, a maximum slope of 12 degrees (21,3 %), and shall be designed in accordance with European or National Rules. For platforms on the Conventional Rail Network, two nominal values are permissible for platform height: 550 mm and 760 mm above the running surface. The tolerances on these dimensions shall be within –35 mm/+ 0 mm. Note to be removed from the CR PRM TSI at the end of the process: The High-Speed Infrastructure TSI sets out the requirements for platforms on the High-Speed Rail Network. The calculated value bqlim is specified in pr EN15273-3:2006 and takes into consideration all other values that are not included within the formula of bq0. The actual value of bq for the positioning of the platform edges from the track centre parallel to the running plane will allow for variation due to the tolerance Tq for the positioning of the platform edges or their maintenance: bqlim ≤ bq ≤ bqlim + Tq. The tolerance Tq shall be 0 ≤ Tq ≤ 50 mm. Effect of cant shall be compensated outside of the curve for the part exceeding 25 mm by a platform edge overhanging above the recess required to the quasi static inclination of the structure gauge perpendicularly to the running surface. As a consequence, the actual gap may be greater than the conventional gap. Note to be removed from the CR PRM TSI at the end of the process: Platforms on lines of Category I of the High-Speed Rail Network shall comply with the High-Speed Infrastructure TSI. Note to be included in the High-Speed Infrastructure TSI: Platforms on lines of category II and III of the High-Speed Rail Network shall comply with the clause 4.1.2.18.3 of the CR PRM TSI. For platforms on the Conventional Rail Network the track adjacent to the platforms shall preferably be straight, but shall nowhere have a radius of less than 300 m.
For a single side platform 2 500 mm, or for an island platform 3 300 mm (this dimension may taper to 2 500 mm at the platform ends). The minimum width requirement does not take into account additional width that may be required for passenger flows. It is permitted to have small obstacles of a length of less than 1 000 mm (for example:- masts, pylons, booths, seats) inside this freeway of 1 600 mm. The distance from the edge of the platform to the obstacle shall be a minimum of 1 600 mm and there shall be a minimum freeway of 800 mm from the edge of the obstacle to the danger area. If the distance between any two small obstacles is less than 2 400 mm they shall be deemed to form one large obstacle. The minimum distance from the edge of obstacles like walls, seating places, lifts and stairs that have a length of more than 1 000 mm but less than 10 000 mm, and the edge of the danger zone, shall be 1 200 mm. The distance between the edge of the platform and the edge of this obstacle shall be a minimum of 2 000 mm. The minimum distance from the edges of obstacle like walls, seating places, travelators and stairs that have a length of more than 10 000 mm, and the edge of the danger zone, shall be 1 600 mm. The distance between the edge of the platform and the edge of this obstacle shall be a minimum of 2 400 mm. If there are auxiliary facilities on-board trains, or on the platform, to allow wheelchair users to board on or alight from trains, a free space of 1 500 mm from the edge of the facility where the wheelchair boards, or lands, at the platform level, to the next obstacle on the platform, or to the opposite danger area, shall be provided where such facilities are likely to be used. A new station shall meet this requirement for all trains that are planned to stop at the platform. The danger area of a platform commences at the rail side edge of the platform and is defined as the area where passengers may be subject to dangerous forces due to the slipstream effect of moving trains dependent upon their speed. For the conventional rail system, this danger area shall be in accordance with National Rules. The boundary of the danger area, furthest from the rail side edge of the platform, shall be marked with visual and tactile warnings. The tactile marking shall be in accordance with National Rules. The visual warning shall be a colour contrasting, slip resistant, warning line with a minimum width of 100 mm. The colour of the material at the rail side edge of the platform shall contrast with the darkness of the gap. This material shall be slip resistant. The end of the platform shall have both visual and tactile markings. unless there is a station stop within 30 km, on the same route, provided with boarding aids. The responsible Infrastructure Manager (or Station Manager(s) if they are the responsible entities) and Railway Undertaking shall agree the management of the boarding aid in line with Regulation (EC) No 1371/2007 of the European Parliament and Council on Rail Passengers' Rights and Obligations (1) in order to establish which party is responsible for provision of boarding aids. The Infrastructure Manager (or Station Manager(s)) and Railway Undertaking shall ensure that the division of responsibilities they agree is the most viable overall solution. the specific rules for stopping the trains in order to comply with clause 4.1.2.19 (area for boarding aids for wheelchair users). In its Safety Management System, the Railway Undertaking shall indicate what its obligations are according to such agreements, and how it intends to comply with them. In its Safety Management System, the Infrastructure Manager shall indicate what its obligations are according to such agreements, and how it intends to comply with them. In the paragraphs above, the Station Manager operating the platforms is considered as an Infrastructure Manager according to Directive 91/440/EC art 3: definition of Infrastructure and regulation 2598/70/EC. If the result of the above is that all types of Rolling Stock stopping at the platform are equipped with boarding aids compatible with the platform, it is permissible for aids not to be provided at the platform. The boarding aid shall fulfil the requirements of clause 4.1.2.21.2.If the wheelchair boarding position is pre-defined, the platform position(s) of the wheelchair accessible doorway(s) may be marked with the international symbol for the ‘provision for the disabled or handicapped persons’. Such signs shall be in accordance with Annex N Clauses N.2 and N.4. An access ramp, whether manual or semi-automatic, to be operated by a member of staff, shall be made available whether stored on the station platform or on board. The ramp shall fulfil the requirements of clause 4.1.2.21.2. If a platform lift is used, it shall comply with the requirements of clause 4.1.2.21.2. The boarding aid shall withstand a weight of at least 300 kg, placed at the centre of the device distributed over an area of 660 mm by 660 mm. If the boarding device is power operated the boarding aid shall incorporate an emergency method of manual operation should power fail. Ramps shall have raised edges on both sides to prevent mobility aid wheels from slipping off. The ramp slope shall have a maximum slope of 10,2 degrees (18 %). A secure storage method shall be provided to ensure that ramps, including portable ramps, when stored do not cause an obstruction to passengers. The lift platform surface shall be slip resistant. At surface level, the lift platform shall have a minimum clear width of 720 mm. The design of the lift shall ensure that the vehicle cannot be moved when the lift is not stowed. The lift shall incorporate an emergency method of deploying, lowering to ground level with a lift occupant, and raising and stowing the empty lift if the power to the lift fails. No part of the lift platform shall move at a rate exceeding 150 mm/second during lowering and lifting an occupant, and shall not exceed 300 mm/second during deploying or stowing (except if the lift is manually deployed or stowed). The maximum lift platform horizontal and vertical acceleration when occupied shall be 0,3 g.
The lift shall permit both inboard and outboard facing of wheelchair. If level track crossings are permitted to be used by passengers according to the National Rules, and required to provide the obstacle-free route, they shall be accessible to all categories of PRM. 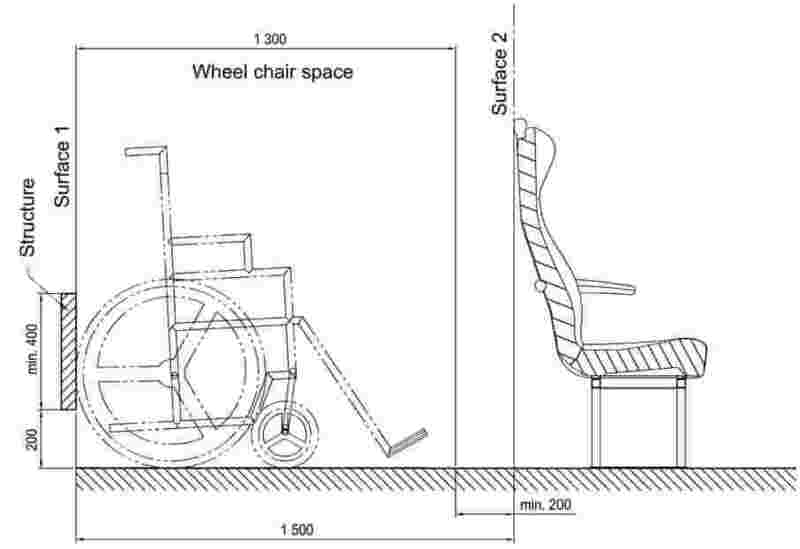 They shall be designed so that the smallest wheel of a wheelchair, as defined in Annex M, cannot be trapped within the crossing surface and the rail. Visual and tactile markings shall be provided to identify the boundaries of the crossing surface. Due to the fact that the Conventional Rail TSIs do not, currently, exist for passenger Rolling Stock and for Infrastructure, this section remains an open point. There is no interface with the Control Command and Signalling subsystem. The interfaces with the Operation subsystem are described in section 4.1.4 ‘Operating Rules’. The following operating rules do not form any part of the assessment of Infrastructure. This TSI does not specify operating rules for evacuation in the case of hazardous situations, only the relevant technical requirements. The purpose of the technical requirements for Infrastructure is to facilitate evacuation for all, including PRM. When a new, renewed or upgraded stations that have a daily passenger flow of 1 000 passengers or less, combined embarking and disembarking, averaged over a 12 month period, does not meet the requirements related to the lift and/or ramp aspects of the obstacle-free route requirements according to clause 4.1.2.3.1, National Rules shall be applied for organising the transport of wheelchair users by an accessible means between this non accessible station and the next accessible station on the same route. Operating rules shall be made to ensure that information regarding the level of accessibility of all stations is freely available. In cases where turnstiles are utilised for ticketing control, operational rules shall be implemented, whereby PRM are offered parallel access through such control points. This PRM access shall permit wheelchair users, prams, bulky baggage, etc and may be controlled by staff or be automatic. Operating rules shall be implemented to ensure consistency between essential visual and spoken information (refer to Section 4.1.2.12). Staff making announcements shall follow standard procedures to achieve complete consistency of essential information. In situations where essential spoken information is not provided via a public address system at a station (refer to 4.1.2.12), operating rules shall be implemented to ensure the provision of an alternative information system, whereby passengers are able to acquire the same information audibly at the station (e.g. a staffed or automated telephone information service). A consequence of above is that the stopping point of the train shall in some cases be adjusted in order to comply with this requirement. Operational rules shall be implemented to take account of train composition variations (refer to Section 4.1.2.19) such that the stopping point of trains can be determined with respect to the boarding aid operational zones. A free space of 1 500 mm from the platform edge shall be provided on the platform for each boarding aid (refer to 4.1.2.19). Operations rules shall be implemented concerning the operation of boarding aids by station staff (refer to Section 4.1.2.21.1 & 2). An operational rule shall be implemented concerning the use by staff of the moveable safety barrier fitted to wheelchair lifts (refer to Section 4.1.2.21.2). Operational rules shall be implemented to ensure that staff are able to safely operate boarding ramps, with respect to deployment, securing, raising, lowering and stowing (refer to Section 4.1.2.21.2). Operational rules shall be implemented to ensure that staff are aware that wheelchair users may require assistance to board and alight the train, and shall provide such assistance if required. Wheelchair users may be required to book such assistance in advance in order to ensure that trained staff are available. Where National Rules permit supervised level track crossings, operating rules shall be implemented to ensure that staff at supervised level track crossings give appropriate assistance to PRM, including indication of when it is safe to cross the track. The Infrastructure Manager or Station Manager shall have procedures that include the provision of alternative assistance to PRM during maintenance, replacement or repair of facilities that are for PRM use. Professional training of staff performing the tasks of accompanying trains, delivering service and help for passengers at a station and of selling tickets shall include the subject of disability awareness and equality, including the specific needs of each category of PRM. Professional training of engineers and managers, responsible for maintaining and operating the Infrastructure, shall include the subject of disability awareness and equality, including the specific needs of each category of PRM. There are neither specific requirements in the scope of this TSI related to the health and safety conditions of staff required for the operation of the Infrastructure Subsystem nor for the implementation of the TSI. For each station identified, the platforms at that station that fall within the scope of this TSI shall be listed. Level track crossings where these are available for use by PRM in accordance with Clause 4.1.2.22. Where National Rules have been applied in order to establish conformance with this TSI, the relevant rules and clauses shall be stated against the relevant item in the register. The functional and technical specifications of the subsystem and its interfaces, described in sections 4.2.2, do not impose the use of specific technologies or technical solutions, except where this is strictly necessary for the interoperability of the trans-European conventional rail network. But innovative solutions for interoperability may require new specifications and/or new assessment methods. In order to allow technological innovation, these specifications and assessment methods shall be developed by the process described in sections 6.1.4 and 6.2.4. For each basic parameter a general clause introduces the following clauses. These following clauses detail the conditions to be met in order to fulfil the requirements introduced in the general clause. Handholds or vertical handrails or other items that can be used for personal stability, whilst using the aisle, shall be provided on seat backs of all aisle-side seats unless the seat touches the back of another seat facing in the opposite direction which is fitted with a handhold or touches a partition. Handholds or other items that can be used for personal stability shall be positioned at a height of between 800 mm and 1 200 mm above the floor, shall not protrude into the clearway and shall contrast with the seat. Not less than 10 percent of the seats by fixed trainset or individual vehicle, and by class shall be designated as priority seats for the use of PRM. The priority seats and vehicles containing them shall be identified by signs complying with Annex N Clauses N.3 and N.8 and shall state that other passengers should make such seats available to those who are eligible to use them. The priority seats shall be located within the passenger saloon and in close proximity to external doors. When seats are fitted with armrests, priority seats shall be fitted with movable armrests, this excludes armrests placed along the vehicle bodyside. The movable armrest shall move into a position in line with the seat back cushion to enable unrestricted access to the seat or to any adjacent priority seats. Each priority seat and the space available to its user shall comply with the diagrams shown in the figures 1 to 4. The whole useful sitting surface of the priority seat shall be a minimum of 450 mm wide (see figure1). The top of each priority seat cushion shall be between 430 and 500 mm above floor level at the front edge of the seat. 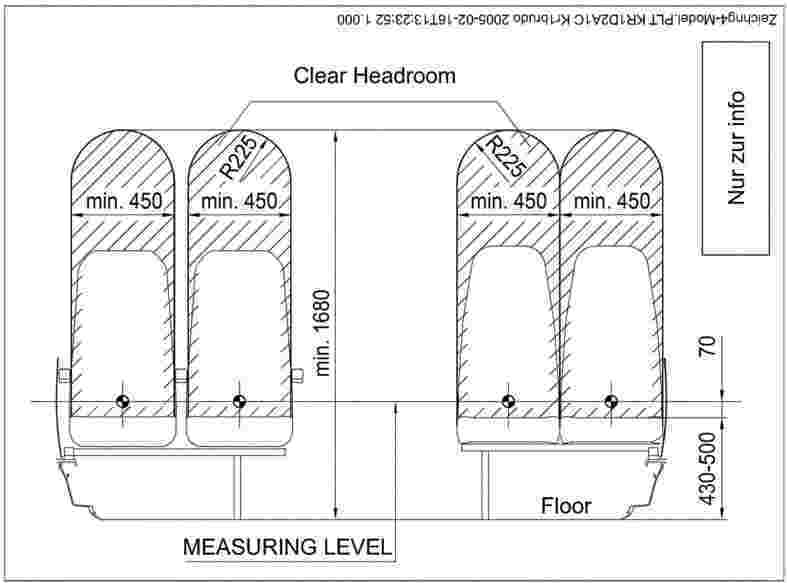 The clear headroom above each seat shall be at least 1 680 mm from floor level (see figure 2), except on double-decker trains on which luggage racks are provided above the seats. In such case a reduced headroom of 1 520 mm is permitted for priority seats underneath the luggage racks, provided that at least 50 % of priority seats maintain a headroom of 1 680 mm. Note: In the following figures nos. 2 to 4 the cross sectional views shown are taken through the centre line of the seat. Where uni-directional priority seats are provided, the clearance in front of each seat shall comply with figure 2. As shown in figures 1 to 4, the distance between the front surface of the seat back and the vertical plane through the rearmost part of the seat in front shall be a minimum of 680 mm, noting that the required seat pitch shall be measured from the centre of the seat 70 mm above where the cushion meets the back support. There shall also be a clear space between the front edge of the seat cushion and the same vertical plane for the seat in front of a minimum of 230 mm. 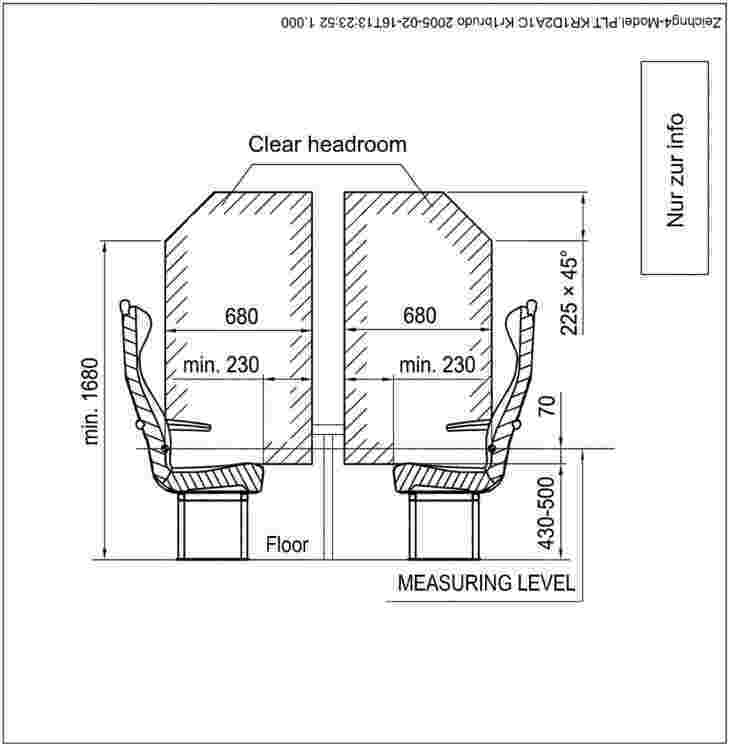 Where facing priority seats are provided, the distance between the front edges of the seat cushions shall be a minimum of 600 mm (See figure 4). 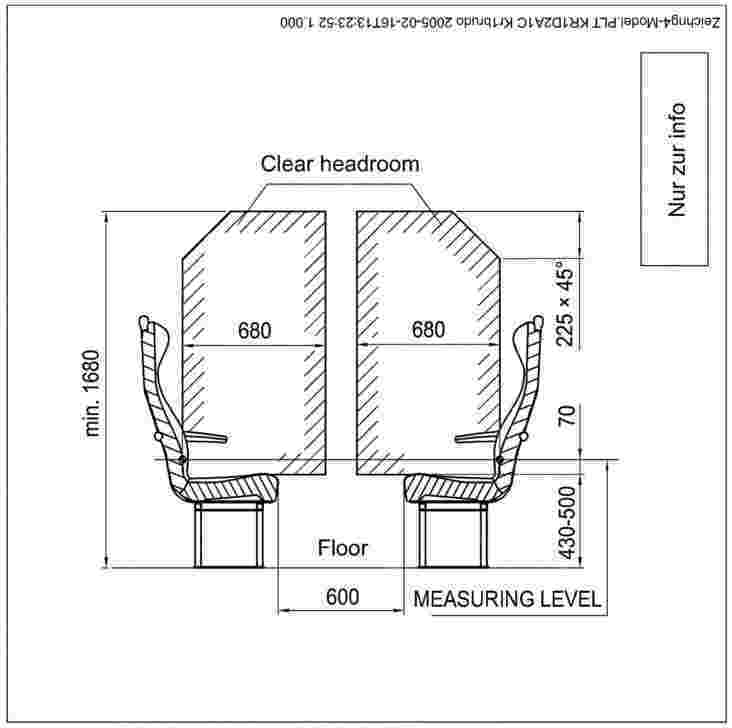 Where facing priority seats are equipped with a table, there shall be a minimum clear horizontal distance between the front edge of the seat cushion and the leading edge of the table of at least 230 mm (See figure 3). There shall be no obstruction of the designated space between the floor and the ceiling of the vehicle other than an overhead luggage rack, a horizontal handrail attached to the wall or ceiling of the vehicle or a table in accordance with the requirements of clause 4.2.2.10. 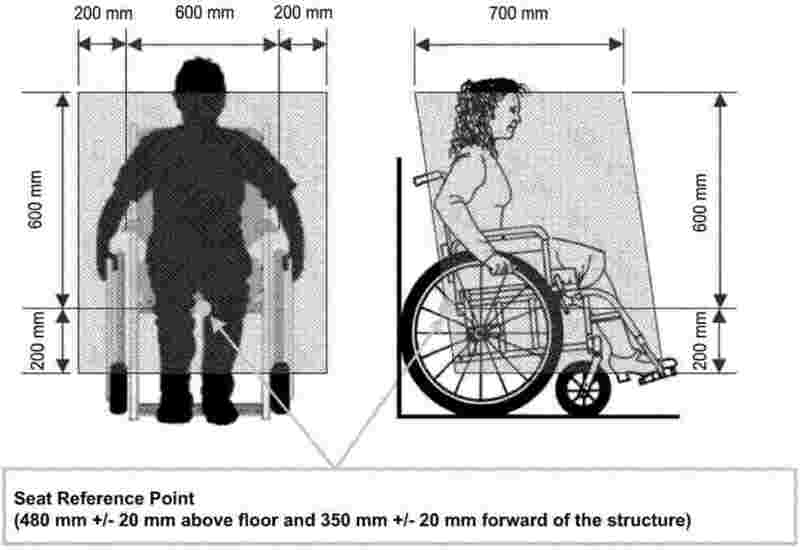 The minimum distance in the longitudinal plane between the wheelchair space and a front surface 2 shall be in accordance with figure 5. Surface 1 may be a closed tip-up or foldable seat, or a partition. If surface 2 is the front edge of a passenger seat cushion in a facing arrangement and if this seat can be occupied by a passenger, the minimum distance shall be not less than 300 mm. If surface 2 is a passenger seat back in a uni-directional arrangement, or a partition or a closed tip-up or foldable seat in front of wheelchair space, the minimum distance shall be not less than 200 mm. Tip-up or folding seats may be installed in the wheelchair space but, when in the stowed position, shall not encroach on the dimensional requirements of the wheelchair space. 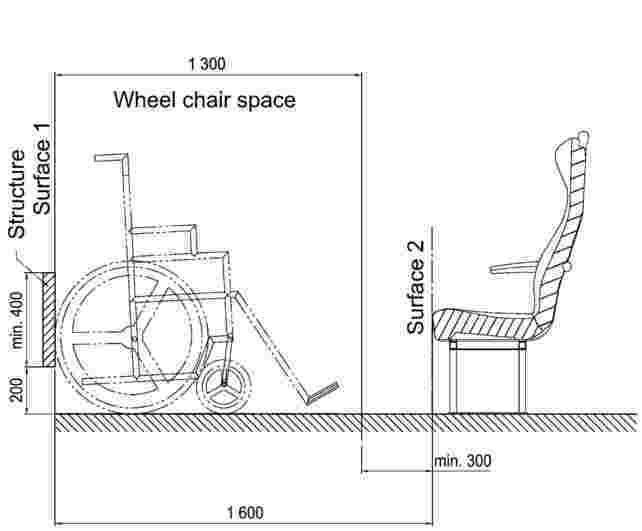 There shall be a structure or other acceptable fitting 700 mm wide (as shown in figure 6) at one end of the wheelchair space. The height of the structure, or fitting, shall be capable of preventing a wheelchair that has been positioned with its back against the structure or fitting, from tipping over backwards. At least one seat shall be available either adjacent to or facing to the wheelchair spaces for a companion to travel with the wheelchair user. This seat shall offer the same level of comfort as other seats, and may also be situated on the opposing side of the clearway. The wheelchair space shall be fitted with an alarm device that shall, in the event of danger, enable a wheelchair user to inform a person who can take appropriate action. It shall be placed within reach of a person seated in a reference wheelchair. When the alarm device has been activated a visual and audible indication that the alarm system is working shall be provided. The alarm device shall not be placed within a narrow recess or any other form of shielding which prevents immediate palm operation. The positioning of the alarm device shall be within the comfortable reach of the person using the wheelchair rather than at the maximum limits. A sign conforming to Annex N Clauses N.3 and N.4 shall be placed immediately next to, or in, the wheelchair space so as to identify the space as the wheelchair space. To latch or unlatch a manually operated door, for use by the public, the control device shall be operable by the palm of the hand exerting a force not exceeding 20 Newtons. Door controls, whether manual or pushbuttons, shall contrast with the surface on which they are mounted. If pushbuttons or other remote control devices are provided for operation of doors then each pushbutton or device shall be operable by a force not greater than 15 Newtons. External passenger access, automatic and semi-automatic, doors shall incorporate devices that detect if they close on a passenger where a passenger is detected the doors shall automatically stop and remain free for a limited period of time. External doors shall be painted or marked on the outside in a way that gives a contrast to the rest of the vehicle body-side. The door to be used for wheelchair access shall be clearly labelled with a sign in accordance with Annex N Clauses N.3 and N.4. From the inside of the vehicle the position of external doorways shall clearly be marked by use of contrast on the flooring adjacent to the doorway, as compared with the rest of the flooring of the vehicle. When a door is enabled for opening a signal shall be given that is clearly audible to persons inside and outside the train. This alert signal shall sound for a minimum of five seconds unless the door is operated, in which case it may cease after 3 seconds. This requirement is not applicable for external audible signals on high speed Class 1 and Class 2 trains. When a door is automatically or remotely opened by the driver or other member of the traincrew, the alert signal shall sound for a minimum 3 seconds from the moment that the door starts to open. When a door that is automatically or remotely closed, is about to operate, an audible alarm shall be given to persons inside and outside the train. The alarm shall sound for a minimum of 2 seconds before the door starts to close and shall be different in tone to that used when the door is released. The alarm shall continue to sound while the door is closing. The method of door activation shall be by traincrew or semi-automatic (i.e. passenger pushbutton operation). The centre of exterior door controls, operable from the platform, shall be not less than 800 mm and not more than 1 200 mm measured vertically above platforms, for all platforms at which the train will stop. The centre of internal door controls for the exterior door shall be not less than 800 mm and not more than 1 200 mm measured vertically above the vehicle floor level. If pushbuttons are provided for operation of doors then each pushbutton shall have visual indication, on or around the push button, when enabled and shall be operable by a force not greater than 15 Newtons. If the door closure is remotely activated by traincrew, the visual indication shall cease not less than 2 seconds before the door starts to close. Such pushbuttons shall be identifiable by touch (for example:- tactile markings) and shall indicate the functionality. If interior doors are fitted they shall comply with the requirements of this clause. Door openings that are made available for wheelchair users shall have a minimum clear useable width of 800 mm. The force required to open or close a manual door shall not exceed 60 Newtons. The centre of interior door controls shall be not less than 800 mm and not more than 1 200 mm measured vertically above the vehicle floor level. Automatic inter-vehicle and consecutive connecting doors shall operate either synchronously as a pair, or the second door shall automatically detect the person moving towards it and open. If more than 75 % of a door's surface is made of a transparent material, it shall be marked with a minimum of two prominent bands made of signs, logos, emblems or decorative features. They shall be at a height between 1 500 mm and 2 000 mm for the upper band, and between 850 mm and 1 000 mm for the lower band, contrasting with the background over the entire width of the door. These bands shall be a minimum of 100 mm high. If pushbuttons are provided for operation of doors then each pushbutton shall be illuminated (or the surround shall be illuminated) when enabled and shall be operable by a force not greater than 15 Newtons. Such controls shall be identifiable by touch (for example:- tactile markings) and shall indicate the functionality. Vehicle access steps shall be illuminated to a minimum of 75 Lux, measured across 80 % of the width of the step by a light placed within or immediately adjacent to it. When toilets are fitted in a train access to a universal toilet shall be provided from the wheelchair space and comply with the requirements of both the standard and universal toilets. The centre of any door handle, lock or door control device on the exterior or interior of the toilet compartment shall be located at a minimum of 800 mm and a maximum of 1 200 mm above the floor. A visual and tactile (or audible) indication shall be given to indicate when a door has been locked. Any door control device, and other equipment inside the toilet compartment (except for baby change facilities) shall be operable by exerting a force not exceeding 20 Newtons. Any control device, including flushing system, shall be provided in a contrasting colour and/or tone to the background surface, and shall be identifiable by touch. A fixed vertical and/or horizontal handrail shall be provided adjacent to the toilet pan and the wash basin. Handrails shall be round in section with an outside diameter of 30 mm to 40 mm, and shall have a minimum clear distance of 45 mm to any adjacent surface. If a handrail is curved, the radius to the inside face of the curve shall be a minimum of 50 mm. The toilet seat and lid, and any handrails shall be in a contrasting colour and/or tone to the background. A universal toilet is a toilet designed to be used by all passengers including all categories of PRM. The toilet access door shall provide a minimum clear useable width of 800 mm. The exterior of the door shall be marked with a sign in accordance with Annex N Clauses N.3 and N.4. There shall be sufficient space inside the toilet compartment to enable a wheelchair as defined in Annex M to be manoeuvred to a position adjacent to the toilet seat, see figure 8a. 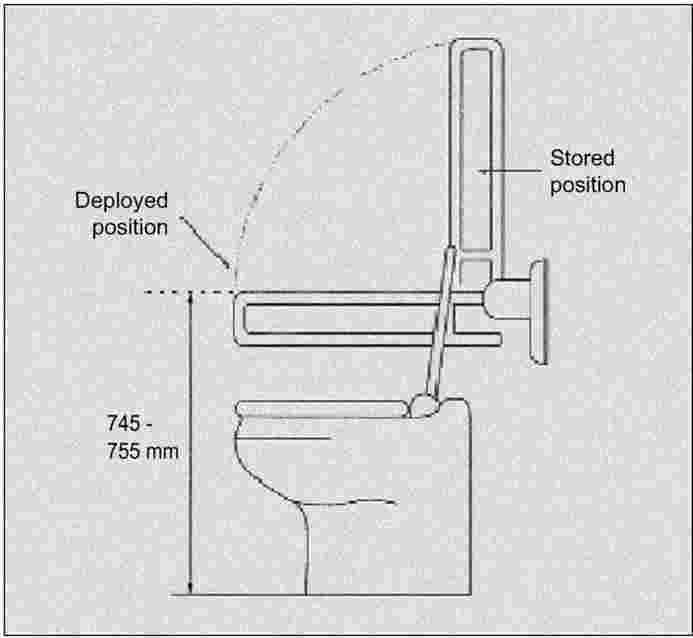 In front of the toilet seat there shall be a minimum clear space of 700 mm as shown in figure 8b. A horizontal handrail that complies with the dimensional requirements in the clause above shall be provided at each side of the toilet seat. The handrail on the wheelchair accessible side shall be hinged in such a way so as to enable an unobstructed transfer for the wheelchair user to and from the toilet seat, see figures 9 and 10. The surface of the toilet seat, when lowered shall be at a height of 450 mm to 500 mm above the floor level. All amenities (wash basin, soap dispenser, mirror, water dispenser and hand dryer) shall be readily accessible to a person in a wheelchair. The toilet cubicle shall be fitted with not less than two alarm devices that shall, in the event of danger enable, a PRM to inform a person who can take appropriate action. One shall be placed not more than 450 mm above the floor, measured vertically from the surface of the floor to the top of the control. The other shall be not less than 800 mm and not more than 1 200 mm above the floor measured, vertically to the top of the control. The lower alarm device shall be positioned so that the control can be reached by a person lying on the floor. These two devices shall be located on different vertical surfaces of the cubicle so that they can be reached from a range of positions. The alarm control shall be distinct from any other control within the toilet and be coloured differently from other control devices. A sign in accordance with Annex N Clauses N.3 and N.7 shall be placed immediately next to each alarm device. The sign shall describe the function and required actions and shall contrast with the background and give clear visual and tactile information. A visual and audible indication that the alarm system has been operated shall be provided within the toilet. If separate nursery facilities are not provided a facility to enable the changing of babies' nappies shall be incorporated within the universal toilet. In the lowered position, the changing facility shall be between 800 mm and 1 000 mm above floor level. It shall be a minimum of 500 mm wide and 700 mm long. From the vehicle entrance the minimum clearway width through the vehicle shall be 450 mm from floor level to a height of 1 000 mm and 550 mm from a height of 1 000 mm to 1 950 mm. The clearway width between connecting vehicles of a single trainset shall maintain a minimum of 550 mm measured on straight and level track. Access to and from wheelchair spaces, wheelchair accessible areas and wheelchair accessible doors shall have a minimum clearway width of 800 mm wide up to a minimum height of 1 450 mm at any point. The clearway shall be arranged to permit unobstructed movement of the reference wheelchair as detailed in Annex M.
A turning space, with a minimum diameter of 1 500 mm, shall be provided adjacent to the wheelchair space for the disabled person in the reference wheelchair to turn the wheelchair around. The wheelchair space may be part of the turning circle. All information shall be of a consistent nature and in accordance with European or National Rules. All information shall be coherent with the general routeing and information system especially colour and contrast in trains, platforms and entrances. Visual information shall be legible in all lighting conditions when the vehicle or station is operational. Descenders in Roman script shall be clearly recognisable and have a minimum size ratio of 20 % to the upper case characters. All safety, warning, mandatory action and prohibition signs shall include pictograms and shall be designed according to ISO 3864-1. The symbols in can be combined with other symbols (for example: lift, toilet, etc). Where inductive loops are fitted these shall be indicated by a sign complying with Annex N Clauses N.3 and N.5. If there is a call for assistance or call for information facility, this shall be indicated by a sign complying with Annex N Clauses N.3 and N.6. Additional operating information if necessary. The final destination or route shall be displayed outside of the train on the platform side adjacent to at least one of the passenger access doors on a minimum of alternate vehicles of the train. Where trains operate in a system, in which dynamic visual information is given on the station platforms within a distance of 50 meters, and destination or route information is also provided on the front of the train, it is not mandatory to provide information on the sides of each vehicle. The next stop of the train shall be displayed such that it can be read from a minimum of 51 % of passenger seats inside each vehicle. This information shall be displayed at least two minutes before arrival at the station concerned. If the next station is less than two minutes planned journey time away, the next station shall be displayed immediately following departure from the previous station. The requirement to make the destination and ‘next stop’ displays visible to 51 % from passenger seats need not be met if the train is partly or wholly divided into compartments of not more than 8 seats, which are serviced by a corridor. However, a display shall be visible to a person standing in a corridor outside a compartment and shall be visible to a passenger occupying a wheelchair space. The information about the next stop may be shown on the same display as the final destination. However, it shall revert to show the final destination as soon as the train has stopped. The system shall be capable of giving announcements in more than one language. (The choice and number of languages shall be the responsibility of the Railway Undertaking having regard to the clientele of an individual train service). If the system is automated, it shall be possible to suppress, or correct, incorrect or misleading information. If the vehicle provides reserved seats then the number or letter of the vehicle (as used in the reservation system) shall be displayed on or adjacent to every door in characters not less than 70 mm high. The train shall be fitted with a public address system which shall be used either for routine or emergency announcements by the driver or by another crewmember who has specific responsibility for passengers. The system may operate on a manual, an automated or pre-programmed basis. If the system is automated, it shall be possible to suppress, or correct, incorrect or misleading information. The system shall be used to announce the destination and next stop of the train, or on departure from, each stop. The system shall be used to announce the next stop of the train at least two minutes before the arrival of the train at that stop. If the next station is less than two minutes planned journey time away, the next station shall be announced immediately following departure from the previous station. The spoken information shall have a minimum RASTI level of 0,5, in accordance with IEC 60268-16 part 16, in all areas. The system shall meet the requirement at each seat location and wheelchair space. Each station name (which may be abbreviated), or words of messages, shall be displayed for a minimum of 2 seconds. If a scrolling display is used (either horizontal or vertical), each complete word shall be displayed for a minimum of 2 seconds and the horizontal scrolling speed shall not exceed 6 characters per second. Sans Serif fonts, in mixed case, shall be used for all written information. (i.e. not in capital letters only). Upper Case Letters and numbers used in front external displays shall have a minimum height of 70 mm and on side displays 35 mm on bodyside and internal indicators. Inside trains the font size shall be not less then 35 mm for a reading distance in excess of 5 000 mm. 35 mm display characters shall be considered to be legible up to a maximum viewing distance of 10 000 mm. Internal steps (other than those for external access) shall have a maximum height of 200 mm and a minimum depth of 280 mm, measured at the central axis of the stairs. The first and the last step shall be indicated by a contrasting band with a depth of 45 mm to 50 mm extending the full width of the steps on both the front and the top surfaces of the step nosing. For double deck trains it is permitted to reduce this value to 270 mm for the stairs accessing the upper deck. No steps are allowed between the vestibule of a wheelchair accessible exterior door, the wheelchair space, a universal sleeping compartment and the universal toilet except for a door threshold strip that shall not exceed 15 mm in height. All handrails fitted to a vehicle shall be round in section with an outside diameter of 30 mm to 40 mm, and shall have a minimum clear distance of 45 mm to any adjacent surface. If a handrail is curved, the radius to the inside face of the curve shall be a minimum of 50 mm. Doorways with more than two entrance steps shall be provided with handrails on both sides of the doorway, fitted internally as close as practicable to the vehicle outer wall. They shall reach to a height of between 800 mm and 900 mm above the first useable step when boarding the train, according to the platform heights for which the Rolling Stock is designed to be used, and shall be parallel with the line of the step nosing. A vertical handrail shall also be provided for stepping on and off the train. Doorways with up to two entrance steps shall be provided with vertical handrails on both sides of the doorway, fitted internally as close as practicable to the vehicle outer wall. They shall extend from 700 mm to 1 200 mm above the threshold of the first step. Where the clearway of the gangway is less than 1 000 mm and longer than 2 000 mm there shall be handrails or handholds provided in, or adjacent to, inter-vehicle gangways that are provided for passenger use. Where the clearway of the gangway is wider than or equal to 1 000 mm handrails or handholds shall be provided in the gangway. When a train is equipped with sleeping accommodation for passengers it shall provide a vehicle containing not less than one wheelchair accessible sleeping accommodation that shall accommodate a wheelchair with the specification as defined in Annex M.
If there is more than one vehicle with sleeping accommodation for passengers in a train, there shall be not less than two wheelchair accessible sleeping compartments in the train. If a rail vehicle provides wheelchair accessible sleeping accommodation the exterior of the relevant vehicle door shall be marked with a sign in accordance with Annex N Clauses N.3 and N.4. The sleeping accommodation shall be fitted with not less than two alarm devices that shall, in the event of danger enable, a PRM to inform a person who can take appropriate action. One shall be placed not more than 450 millimetres above the floor, measured vertically from the surface of the floor to the top of the control. The other shall be not less than 600 millimetres and not more than 800 millimetres above the floor measured vertically to the top of the control. The lower alarm device shall be positioned so that the control can be reached comfortably by a person lying on the floor. These two devices shall be located on different vertical surfaces of the sleeping accommodation. The alarm devices shall be distinct from any other control within the sleeping accommodation and be coloured differently from other control devices. A sign conforming to Annex N Clauses N.3 and N.7 shall be placed immediately next to each alarm device. The sign shall describe the function and required actions and shall contrast with its background and have clear visual and tactile information. A visual and audible indication that the alarm device has been operated shall be provided within the sleeping accommodation. It shall be demonstrated that the point situated in the central position on the nose of the step (2) of each access door on both sides of a vehicle standing centrally on the rails and in service condition with new wheels but without passengers, shall be located inside the surface identified as ‘step location’ on the figure 11 below, meeting the requirements explained below. Access steps of the vehicle shall be designed to meet the following requirements according to the type of platform where the Rolling Stock is intended to stop, in normal operation. The end of the floor at the access door shall be considered as a step. Steps shall be such that the maximum construction gauge of the vehicle meets the requirements of Annex C of the Freight Wagon TSI. The lowest step (first level) shall be located at the lowest limit of the vehicle construction gauge, according to the requirements of Annex C of the Freight Wagon TSI valid for this vehicle. The horizontal position of the lowest step (first level) shall be located at the outer limit of the vehicle construction gauge, according to the requirements of Annex C of the Freight Wagon TSI valid for this vehicle. 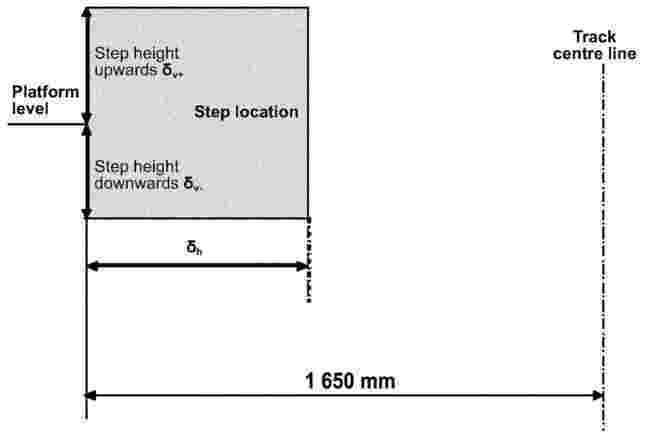 In addition to the relevant requirements above, a step shall comply with the requirements of figure 11 and the following values when the vehicle is stopped at its nominal position, based upon a nominal platform height of 760 mm. Internal steps for external access shall have a maximum height of 200 mm and a minimum depth of 240 mm (going) between the vertical edges of the step. The rising height of each step shall be equal. The first and the last step shall be indicated by a contrasting band with a depth of 45 mm to 50 mm extending the full width of the steps on both the front and the top surfaces of the step nosing. The height of each step may be increased to a maximum of 230 mm if it can be demonstrated that this achieves a reduction of one in the total number of steps required. (For example, if a vertical distance of 460 mm is to be traversed, it can be demonstrated that using steps of up to 230 mm reduces the number of steps required from 3 to 2). An external access step, fixed or moveable, shall have a maximum height of 230 mm between steps and a minimum depth of 150 mm. If a step board is fitted and it is an extension of a door sill outside the vehicle, and there is no change in level between the step board and the floor of the vehicle, this shall not be considered to be a step for the purposes of this specification. A minimal drop in level, with a maximum of 60 mm, between the floor surface of the vestibule and that of the exterior of the vehicle, used to guide and seal the door is also permissible and shall not be considered as a step. When a wheelchair-compatible doorway in a train is intended to be open, in normal operation, at a platform at a station that has obstacle free access routes in accordance with 4.1.2.3.1, a boarding aid shall be provided to be used between that doorway and the platform to allow a passenger in a wheelchair to board or alight, unless it is demonstrated that the gap between the edge of the door sill of that doorway and the edge of the platform is not more than 75 mm measured horizontally and not more than 50 mm measured vertically. The position of the edge of the platforms for which Rolling Stock boarding aids are compatible, in accordance with the preceding paragraph, shall be declared in the characteristics of the Rolling Stock. If the distance does not exceed 30 km between stations on the same route with platforms that the Rolling Stock shall use, and that are equipped with boarding aids for wheelchair users, then it shall not be mandatory for the Rolling Stock to carry such aids. The responsible Infrastructure Manager (or Station Manager(s) if they are the responsible entities) and Railway Undertaking shall agree the management of the boarding aid in line with Regulation (EC) No1371/2007 on Rail Passengers' Rights and Obligations in order to establish which party is responsible for providing any necessary boarding aids. The Infrastructure Manager (or Station Manager(s) and Railway Undertaking shall ensure that the division of responsibilities they agree is the most viable overall solution. The device shall be capable of withstanding on its exposed surface a distributed downward vertical load of 4 kN per metre of step length without causing significant permanent deformation. The device shall be fitted with a device capable of stopping the movement of that step if its front edge comes into contact with any object or person whilst the step is in movement. The maximum force exerted by the device in opening direction shall not exceed the peak force of 300 N when hitting an obstacle. Where passengers are expected to stand on a vertically moveable device inside a vehicle, the step shall not operate with a vertical force of = 150 N applied on an area of 80 mm diameter at any position of the step surface. The device shall incorporate an emergency method of deploying and stowing if the power to the step fails. The device surface shall be slip resistant and shall have an effective clear width of at least 760 mm, except for lifts for which 720 mm is permitted. If the plate is less than 900 mm wide, it shall have raised edges on both sides to prevent mobility aid wheels from slipping off. The device shall withstand a weight of at least 300 kg, placed at the centre of the ramp distributed over an area of 660 mm by 660 mm. A moveable step is a device integrated into the vehicle, fully automatic and activated in conjunction with the door opening/closing sequences. It is permitted to use moveable steps, provided they meet the requirements related to the chosen construction gauge of the Rolling Stock, according to Annex C of the Freight Wagon TSI. In the case of the moving step extending beyond that permitted by the gauging rules, the train shall be immobilised whilst the step is extended. The extension of the moveable step shall be completed before the door opening permits the passengers to cross and conversely, removal of the step may only begin when the door opening no longer permits any crossing of PRM passengers. When staff manually operate the device, it shall be designed for safety and shall require minimum effort for operation. If the boarding device is power operated the boarding aid shall incorporate an emergency method of manual operation should power fail. Such a method shall be capable of being operated in a non-hazardous manner for both occupant and the operator. An access ramp shall be either positioned manually by staff whether stored on the station platform or on board, or deployed semi-automatically by mechanical means, operated by staff or by the passenger. A secure compartment shall be provided to ensure that stowed ramps, including portable ramps, do not impinge on a passenger's wheelchair or mobility aid or pose any hazard to passengers in the event of a sudden stop. A ramp slope shall have a maximum value of 10,2 degrees (18 %). This maximum value may require assistance to the passenger. A control shall ensure that the vehicle cannot be moved when a semi-automatic ramp is not stowed. A bridging plate is a device integrated into the vehicle, fully automatic and activated in conjunction with the door opening/closing sequences. It remains horizontal without support on the station platform. An on-board lift is a device integrated into the doorway of a vehicle that shall be deployed by the train staff. The system shall be able to overcome the maximum height difference between the vehicle floor and the station platform where operated. A secure stowage system shall be provided to ensure that the stowed lift does not impinge on a passenger's wheelchair or mobility aid or pose any hazard to passengers. When the lift is in the stowed position the doorway shall have a minimum useable width of 800 mm. The lift shall ensure that the vehicle cannot be moved when the lift is not stowed. Due to the fact that the Conventional Rail TSI's do not, currently, exist for passenger Rolling Stock and Infrastructure, this section remains an open point. The following operating rules do not form any part of the assessment of Rolling Stock. This TSI does not specify operating rules for evacuation in the case of hazardous situations, only the relevant technical requirements. The purpose of the technical requirements for Rolling Stock is to facilitate evacuation for all, including PRM. Two possible conditions exist in connection with seats classified as ‘priority’; (i) unreserved and (ii) reserved (refer to Section 4.2.2.2.1). In case (i) the operating rules will be directed to other passengers (i.e. provision of signage) requesting them to ensure that priority is given to PRM of all categories that are defined as being eligible to use such seats and that occupied priority seats should be given-up as appropriate. In case (ii) operating rules shall be implemented by the Railway Undertaking to ensure that the ticketing reservation system is equitable with regards to PRM. Such rules will ensure that priority seating is initially only available for reservation by PRM until a given cut-off period prior to departure. This shall also include the possibility for a person with an assistance dog to reserve two spaces — one for the PRM and one for the dog. After this point in time, priority seats will be made available to the entire passenger population, including PRM. Operating rules shall be made to ensure that a PRM with an assistance dog shall not be charged extra. The above priority seating access and reservation rules also apply to wheelchair spaces (refer to Section 4.2.2.3) except that wheelchair users are the only category of PRM with priority. Additionally, operating rules shall provide for (i) unreserved or (ii) reserved accompanying persons (non-PRM) seating adjacent or facing the WCU space. Drop-down seating allows for wheelchair spaces to be converted to universal seating. 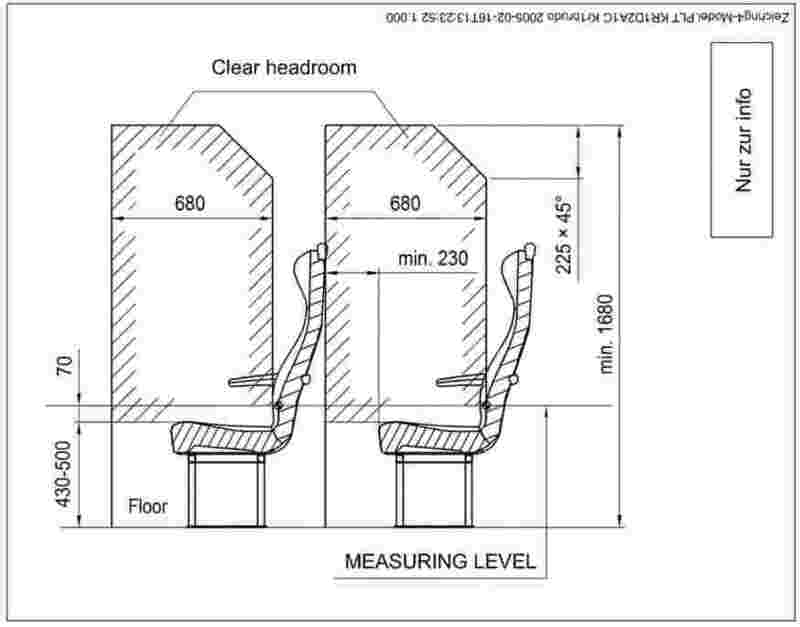 The above priority seating reservation rules also apply to universal sleeping compartments (refer to Section 4.2.2.3). However, operational rules shall prevent non-reserved occupation of universal sleeping compartments (i.e. advanced booking will always be necessary). Operational rules shall be implemented to ensure appropriate response and action from the traincrew in the event of activation of the wheelchair users space emergency alarm (refer to 4.2.2.3). Operational rules shall be implemented regarding the procedure for external door activation by traincrew to ensure safety of all passengers including PRM (refer to Section 4.2.2.4.1). Operational rules shall be implemented to ensure appropriate response and action from the traincrew in the event of activation of the universal toilet emergency alarm (refer to 4.2.2.6.3) by any passenger including PRM. Operational rules shall be implemented regarding the transmission of audible safety instructions to passengers in the event of an emergency (refer to Section 4.2.2.8.1). These rules shall include the nature of the instructions and of their transmission. Operating rules shall be implemented to avoid any potential passenger distraction, by advertisements, of visual information (refer to Section 4.2.2.8.2). These rules shall address the relative positioning, dimensions and lighting of advertisements. Operational rules shall be implemented for the validation and ability to correct erroneous automatic information by the traincrew (refer to Section 4.2.2.8). Operational rules shall be implemented to ensure that the next stop is announced no later than 2 minutes prior to the event (refer to Section 4.2.2.8). Onboard announcements can be recorded or live speech. In both cases, operational rules shall be implemented to justify the languages used, having due regard to the route(s) typical passenger nationality profile, concerning spoken language(s) (refer to Section 4.2.2.8). Operational rules shall be implemented to ensure appropriate response and action from the traincrew in the event of activation of the sleeping compartment emergency alarm (refer to 4.2.2.11) by any passenger including PRM. Operational rules shall be implemented to ensure that train and station staff are able to safely operate boarding ramps, with respect to deployment, securing, raising, lowering and stowing. PRM may be required to book such assistance in advance in order to ensure that trained staff are available. Operational rules shall be implemented for the carriage of pushchairs. Operational rules shall be implemented for the carriage of luggage. When forming a train from a mixture of compliant and non-compliant Rolling Stock, operational procedures shall be implemented to ensure that a minimum of two PRM — TSI compliant wheelchair spaces are provided on the train. Also it shall be ensured that if toilets are available on the train, the wheelchair user has access to a universal toilet. It is accepted that dynamic information systems and wheelchair space/universal toilet alarm devices may not be fully functional when working in such formations. When vehicles that have been individually assessed in accordance with Section 6.2.7 are formed into a train, operational procedures shall be in place to ensure that the complete train complies with all relevant clauses of section 4.2 of this TSI. If a facility that has been incorporated for PRM becomes defective (this includes tactile signs), the Railway Undertaking shall ensure that he has procedures for the facility to be repaired or replaced within 6 working days of the occurrence being reported. Professional training of engineers and managers, responsible for maintaining and operating the trains, shall include the subject of disability awareness and equality, including the specific needs of each category of PRM. There are no specific requirements in the scope of this TSI related to the health and safety conditions of staff required for the operation of the Rolling stock nor for the implementation of the TSI. The requirements for the Rolling Stock Register with regard to this TSI are as specified below. If the Member State of registration changes, the contents of the Rolling Stock Register for that Rolling Stock relating to this TSI shall be passed from the original State of registration to the new State of registration. The Railway Undertaking to confirm that the Rolling Stock is suitable for its requirements. Palm Operated means that the device shall be operable by the palm or any part of the hand in its working position, not requiring fingers to be unclenched. The design need is that passengers with painful conditions, which affect their joints such as arthritis, may be unable to (and are likely to experience discomfort or pain if they do) exert any force with the tip of a single finger. Many will not be able to unclench their fingers to do this. When applying colour to two adjacent surfaces, to provide sufficient contrast, the contrast between the colours will be determined by the light reflectance value, the hue and by the chromatic value of each. For the purposes of this TSI ‘Contrast’ shall be assessed by the diffused light reflectance value, but may be enhanced by variation in hue and chroma. the diffused light reflectance value of the object. the diffused light reflectance value of the background or adjacent surface. When contrast is specified in this TSI there shall be a minimum value of K = 0,3. Where L is the luminous intensity of the diffused light reflected in a given direction from an element of the surface, divided by the area of the element projected in the same direction. A combination of the colours red and green is not allowed for contrast. The measurement of the diffused light reflectance value shall be carried out in accordance with European or National standards. The level of contrast in hue will be determined by the proximity of the two colours within the colour spectrum, so that colours that are close to each other within the spectrum will contrast less well than those that are further apart. The value of chroma in any colour definition describes its intensity and the level of its saturation. The more heavily a colour is saturated, the greater its intensity will be. The ‘First Step’, means the first step of a vehicle that a passenger shall use to board or alight a train. This will normally be the step that is closest to the platform edge. It may be a fixed or a moveable step. ‘Slip resistant’ means that any surface finish used should be sufficiently rough or otherwise specially formulated so that friction between the surface, and a person's shoe or a mobility aid, is maintained at an acceptable level in both wet and dry conditions. It is noted that there is no unique or universally accepted system of determining the co-efficient of friction when defining slip resistance of floor surfaces. For Rolling Stock, therefore, it shall be sufficient to demonstrate that the static co-efficient of friction between a designated ‘slip resistant’ surface and a rubber soled shoe achieves a minimum value of 0,35 even when the surface is wetted by clean water, as measured using a nationally, or internationally, recognised testing method. The grade of rubber used in the test shall be declared with the test results and shall be representative of the types of material used in the manufacture of shoes sold for everyday wear in the member states of the European Union. For Infrastructure, National Rules relating to equivalent designated surfaces in buildings shall apply. ‘Tactile signs’ and ‘tactile controls’ are signs, or controls, including raised pictograms, raised characters or Braille lettering. For tactile pictograms and characters the depth shall be a minimum of 0,5 mm raised above the surface and shall not be engraved and shall be square edged (i.e. not rounded or sharp). The character or pictogram spacing should allow for both sides of the embossed letter, number or symbol to be felt with the fingers in a single pass. The minimum character or number height shall be 15 mm. National Standard Braille shall be used wherever Braille characters are used. The Braille dot shall be dome shaped. Grade I Braille shall be used for single words, and a locator shall be incorporated. The Station Manager is the entity responsible for day-to-day management of a station. This role may be discharged by the Railway Undertaking, the Infrastructure Manager or a third party. Safety information is information that shall be given to passengers in order that they may know in advance how they will have to behave in case of an emergency. Safety instructions are the instructions that shall be given to passengers when an emergency occurs in order that they may understand what to do. A clearway is the unobstructed space to allow movement within a vehicle to areas as designated in chapter 4. A gangway is the means for passengers to pass from one vehicle of a train to the next vehicle. According to Article 2(d) of Directive 2001/16/EC modified by Directive 2004/50/EC, the interoperability constituents are ‘any elementary component, group of components, subassembly or complete assembly of equipment incorporated or intended to be incorporated into a subsystem upon which the interoperability of the trans-European conventional rail system depends directly or indirectly. The concept of a constituent covers both tangible objects and intangible objects such as software’. As stated in section 4 of this TSI, innovative solutions may require new specification and/or new assessment methods. These specifications and assessment methods shall be developed by the process described in clause 6.1.3. The interoperability constituents are covered by the relevant provisions of Directive 2001/16/EC modified by Directive 2004/50/EC and are listed below.